Every year, tech enthusiasts look forward to the new and exciting tech devices that are expected to be released. One of those devices is the Pixel 4 from Google. Regarding the Pixel phones, an alleged schematic design for the Google Pixel 4 XL was leaked. But what’s really interesting is that the design features a front camera setup similar to the Samsung Galaxy S10+. This schematic design showcases the front and rear design of the Pixel 4 XL. It was featured at SlashLeaks and currently sits with a 43 percent trust score. As you can see, the front features an all-screen design with its front camera located at the top right. It’s quite similar to the Galaxy S10+ which was announced in February 2019 and released in March 2019. Although Pixel 3 also featured a dual front camera setup, the only difference is the placement. Moreover, regarding the fingerprint reader, reports suggest that might be in the display. For the back, it also features a dual camera setup. Comparing it to the previous Pixel models, they have only featured a single rear camera. Furthermore, as noted by a report, based on SlashLeaks design leak, we have seen a mockup by PhoneArena as well. Promotional Banner Of The Pixel 4 XL? SlashLeaks recently posted another leak regarding the Pixel 4 XL. 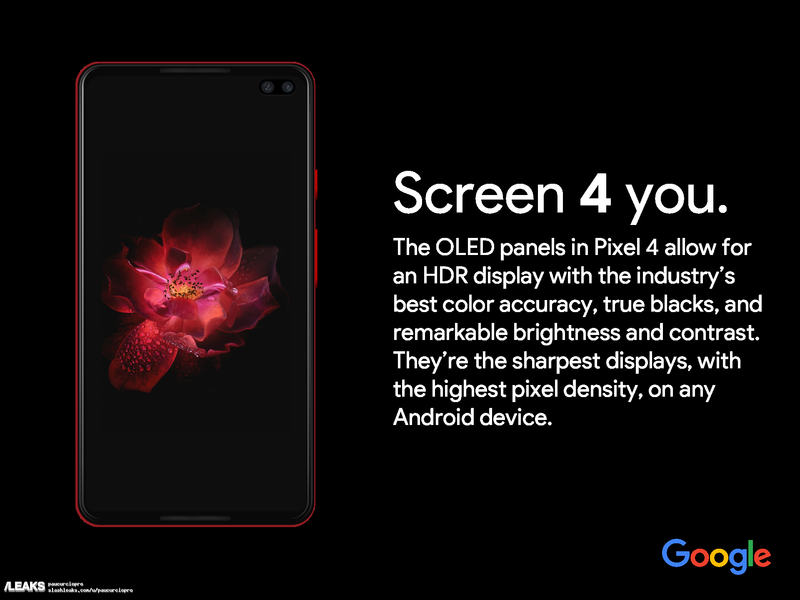 According to the site, it’s an alleged promotional banner of the Pixel 4 XL, showcasing the front design. What are your thoughts about the leaks regarding the Pixel 4 XL? Do you think it’s legit? Tell us in the comment section below.